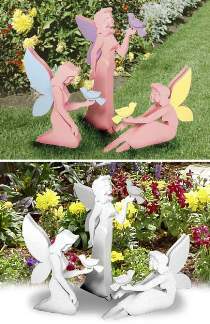 This trio of fairies will add an enchanting feeling to your flower garden or patio. Each project is made from 5 layers of 1/2" plywood. We finished ours in pastel colors - pink, purple, blue and yellow - or simply paint all white. Layered construction makes the project very simple to make and provides a striking three dimensional sculptured look. This plan includes FULL SIZE patterns for all three projects. Projects measure 13", 16-3/4", & 22" high.